The planned mid-January release of Office 2008 offers a significant overhaul of the productivity suite's look and features. The previous segment described the challenges in front of the Mac Business Unit at Microsoft: deliver a new suite of applications with the features of the Windows side, but with an appearance and behaviors attractive to Mac users. Here's a more in-depth look at the specific new features in Word 2008, with some comparisons to Apple's Pages 08 included with iWork. One of the most attractive features of Office 2008 in general is that it's being delivered as a Universal Binary. That means it will now run natively on Intel Macs rather than relying on Apple's Rosetta translation technology to map PowerPC code to run on Intel processors. This should impact how fast Word and other Office applications launch and run. Based on initial testing, it appears that Office 2008 delivers a massive improvement for both launch times and performance in general on Intel systems, but offers very little improvement for PowerPC Macs. It is difficult to make accurate performance observations on an early beta, but the difference on Intel Macs is already very significant, particularly for Word, which seems to lead the Office 2008 suite in terms of stability and progress. Among other things, Word 2008 can now handle live window resizing, something the new Excel and other componets don't yet do. If you forgotten, Word 2004 and the rest of the existing Office suite can't redraw the window while it is being resized; it only draws a resizing outline as applications did on the classic Mac System 7. All modern Mac OS X apps feature live redrawing, and Tiger's QuickTime 7.0 could even redraw live movies while they play. Hopefully Excel and the rest of the Office 2008 suite will catch up to Word by the time Office is planned for release later this winter. The code in Office, portions of which are more than twenty years old, is going through its most significant renewal since it was carbonized as Office v.X back in 2001. The new changes are resulting in some features being different, some being lost, and some new ones being added. 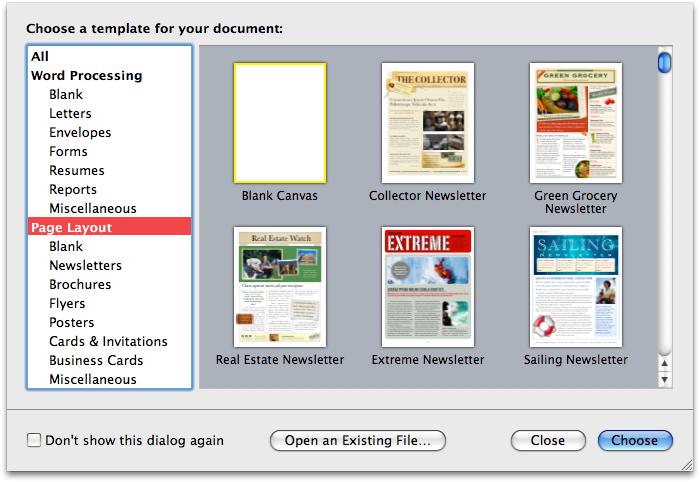 Among the new features in Office 2008 are its new translucency and other graphic effects that rely upon Mac OS X's Quartz Graphics. The Elements Gallery described earlier in Road to Office 2008: installation and interface is subtly translucent in an active window (below left), but becomes almost fully transparent when the window is inactive (below right), as the desktop icon behind it highlights. In contrast with the new Word, Pages 08 is already a Universal Binary and launches and runs without any hesitation. It also lacks any legacy code, as it was first offered in 2005, just prior to the release of Mac OS X 10.4 Tiger. Pages is now at version 3.0, but its entire lifespan has been within the last release of Office, as noted in Claris and the Origins of Apple iWork. How Pages stacks up next to the new Word is noted in the following overview of Word's features. 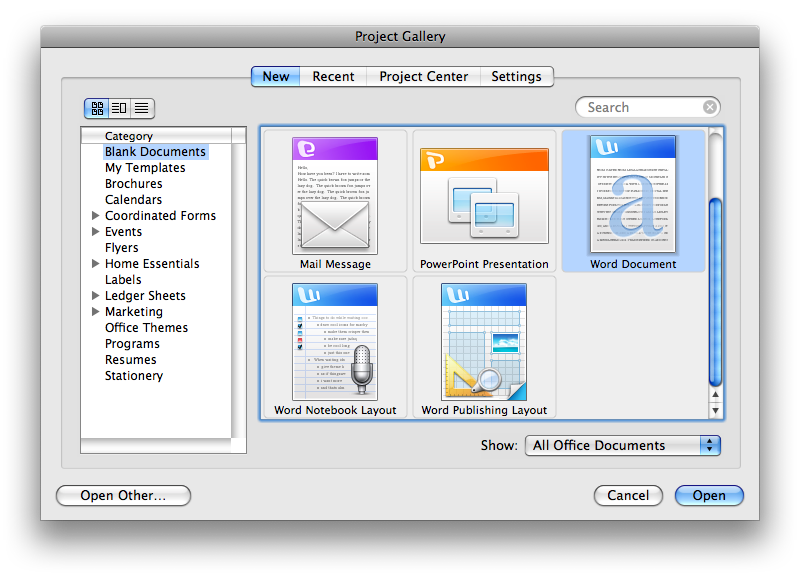 The first noticeable difference in Word 2008 is in the Project Gallery which opens at startup. The existing Word 2004 (below) offers to open a new regular document, create a new notebook, or to start a web page. It also offers to create documents using other Office apps, in case the user launched Word with the idea of creating a PowerPoint presentation. The existing version of Word also presents wizards for creating envelopes and labels, as well as templates for various types of documents; these are both listed in the groups section to the left, but are somewhat hidden among all the text. The templates provided in Word 2004 weren't really very usable either. Word 2008 offers a variety of improvements: rather than offering to build a web page, Word instead focuses on creating a standard word processing document or a publishing layout project, as well as offering to start a voice annotated notebook document designed for note taking. While the templates are still buried, they also appear to be more professional looking and potentially useful as a starting point for creating new documents. The new Project Gallery (below) doesn't show them off very well, but they are also available for selection from within Word using the Elements Gallery. The Office Project Gallery doesn't open by default when you create a new document. 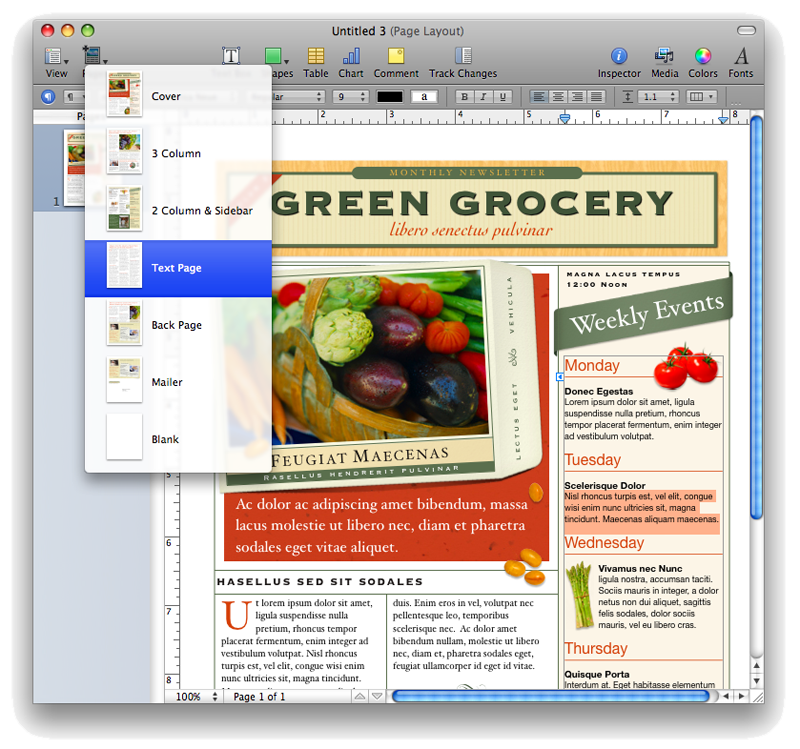 In contrast, Apple's Pages 08 in iWork presents a similar but more streamlined interface (below) for getting started, using a graphical display of templates that defaults to opening a blank document. This template selection window can be easily turned off in both Pages and Word for users who'd rather just start with a blank document. 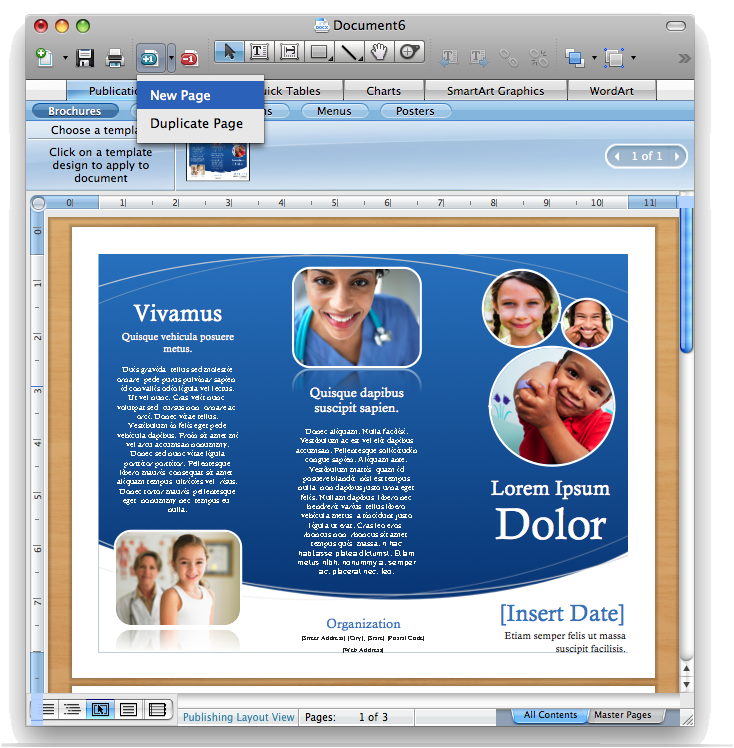 In Word 2004, there were four view modes. The character-based Normal View dated from the days when computers lacked the horsepower to draw the page as it would appear in print, while the separate Page Layout View was intended for previewing how the the document would actually appear when formatted on the page. Two other views provide specialized formatting for an Outline and Notebook view. 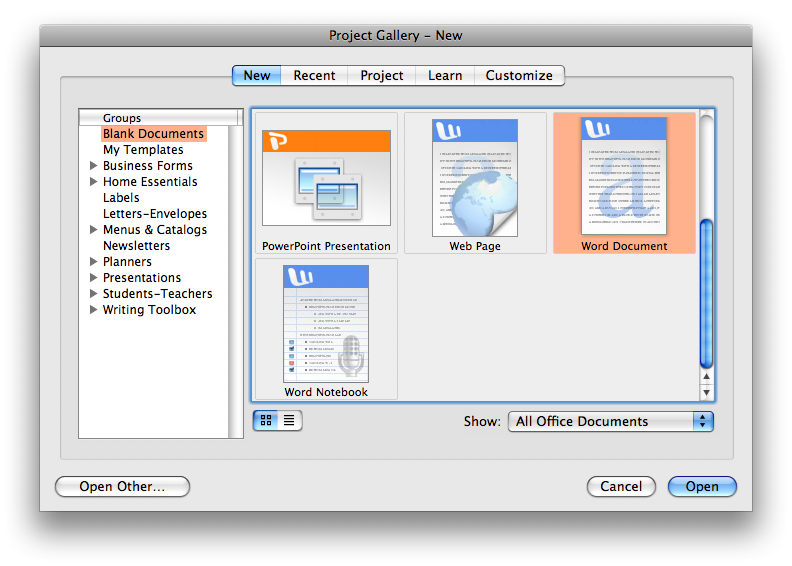 Word 2008 renames Page Layout View to Print Layout View, and introduces a new Publishing Layout View. This new mode offers familiar page layout tools such as text boxes that flow text across columns on the page, guide rulers, master pages, item arrangement tools, and other features that push Word into the territory of Microsoft Publisher, which was never offered on the Mac. In Publishing Layout View (below), the document appears to lay upon a woodgrain background, and the ruler guides change from the tabs-oriented word processing ruler to positioning rulers on the top and left side. This mode also presents an uncluttered toolbar with drop down menus of AutoShapes (discussed below) and lines, a magnifying glass tool for zooming in and out, and arrangement and grouping menus of icons. Within this view, the Elements Gallery selection presents Publication Templates for creating brochures, flyers, programs, menus, and posters, but the beta version only includes nine different templates in total. It's also somewhat confusing to "click on a template to apply to document," but end up with a new document window instead. It's not obvious how to insert template pages into an existing document. If you chose "new page," you get an additional page with a template related background but no content; you can't modify its look or select a specific template page to use instead. In contrast, Pages has you start with a given template family and then, from the Pages button (below), offers to add in additional pages that either match the template style you chose, or offer alternative versions of it.